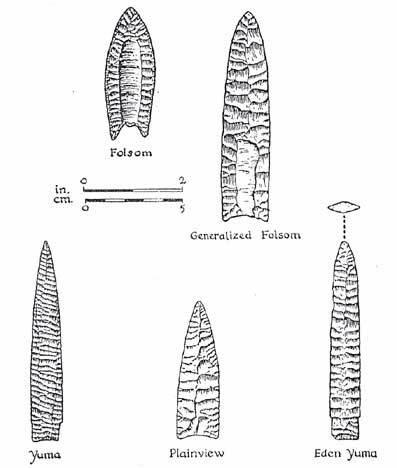 The outstanding feature of the Folsom and the Clovis (Generalized Folsom) points is that a large, elongate flake has been removed from both the flat sides. These points are accordingly grooved or fluted. Folsom Man lived about 10,000 years ago and hunted almost exclusively the extinct buffalo Bison taylori (Figure 11), whereas Lanos Man, connected with the Clovis fluted point was older and mainly a hunter of mammoths. This survived hardly the lee Age, which ended 11-12,000 years ago.